On Friday our ways started to part ^^ Sarah’s class is pretty cool and so the teacher organized a dodgeball game for after school. So Anna and I had to entertain ourselves and decided to check out the next department store: „Feel News“. It more or less consists of only a supermarket and a cheap clothes store, but in the basement there’s a small Serie 100 Yen store and a kid’s corner. I just had to take some pictures for you XD Do you know this guy? 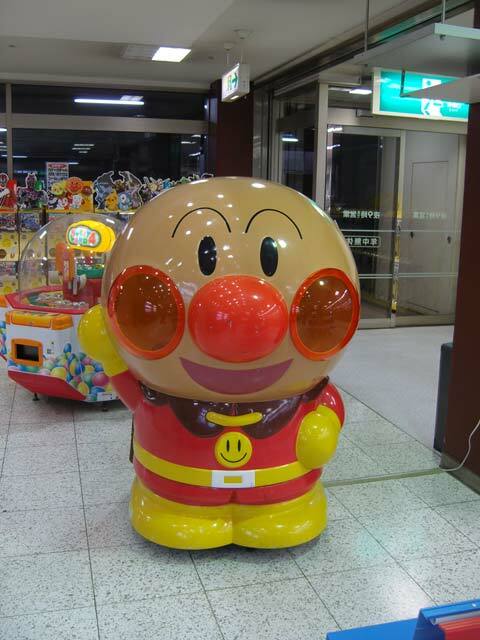 It’s Anpanman! He’s so big, you can actually sit inside (well, at least when you’re a kid). 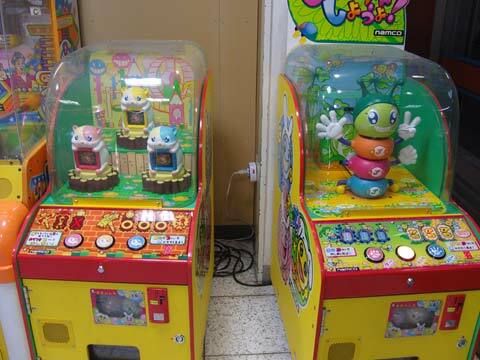 There are like gaming machines everywhere, but of course they are super cute! 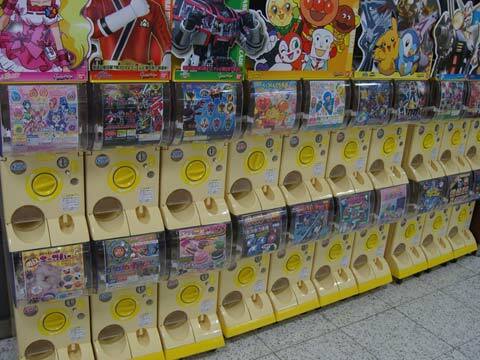 Ans most of you may know gashapon. There’s not only one automat here and there, but there are walls of them. 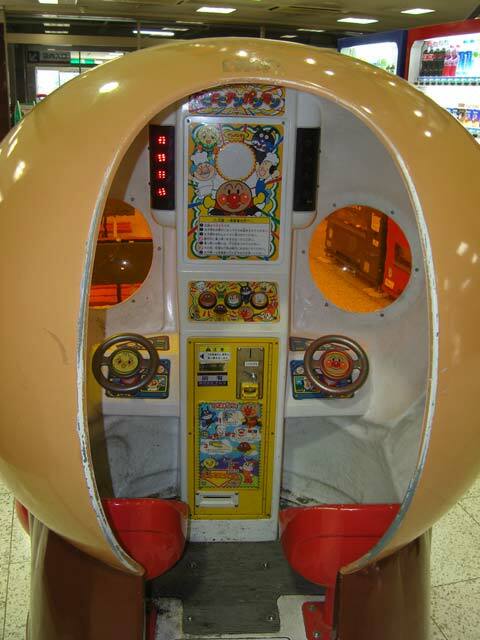 Ther’s nothing you cannot find as a gashapon toy. Anime characters, catpaws that purr if you press them, and squeezable cookies. 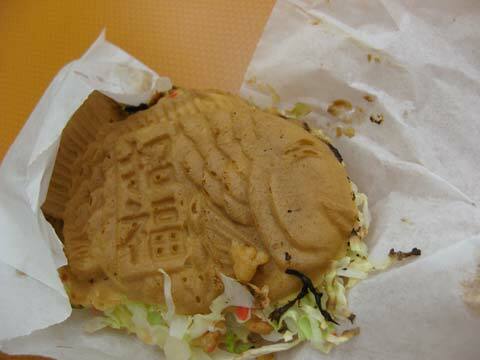 Dises Wasauchimmer-Yaki sieht lecker aus. oo Erinnert mich ein bisschen an nen Kebap oder sowas? „Anpanman“ kenne ich btw noch nicht – woher weißt du immer die ganzen Namen? *lol* Stehen die dran, fragst du..? Ha, wie lustig! Ich hab auch spontan an Kebap gedacht als ich das Ding äh Yaki gesehn hab! Eigentlich is Japan ziemlich kinderfreundlich wenn man das so ansieht… in unseren Einkaufszentrum hast du VIELLEICHT einen Einkaufswagen mit komischen Buggy dran… aber kaum so viele knuffige Sachen…. Uiuiui, diese Automaten sind echt toll. Und dieses Fischli-Dingens gibt es auch gefüllt mit roter Bohnenpaste, gelle? Total lecker jedenfalls!!! Ich mach mir auch langsam Gedanken.. oo Alles klar bei dir?